Ling Ling was one of the youngest members in BSC before she left Brunei in October 2014 to pursue a degree in Law at the University of Kent, UK. There, she resumed her Toastmasters Membership with Canterbury Communicators. A few months ago, Ling Ling made everyone in BSC and Brunei proud by winning the Division H International Speech Contest, and emerging as the second runner up for District 91 International Speech Contest. Ling Ling delivers a speech at BSC. I was a member of the Maktab Sains Gavel Club, set up by Cikgu Yani, a member of BSC. I was a 16 years old nerd with a nervous stutter, who was determined to fake my way through social interactions. I thought I was doing pretty well, until Cikgu Yani decided to take the Gavel Club on a field trip to BSC. That was the first time I met Clovis Lai and also the first time someone told me I can be something special. My first meeting left the strongest impression on me. It wasn’t that everyone was keynote speaker-worthy or anything like that. It’s that regardless of which stage of public speaking they were on, you could clearly see that they wanted to become better. No matter how bad they thought they did, no one would ever judge them for it. Similarly, no matter how well they thought did, no one would ever say that’s the best they can do. That was pretty awe-inspiring for me and I just knew I had to be a part of it. So, the moment I graduated from high school, I went to work and bought my Toastmasters membership with my first pay check. 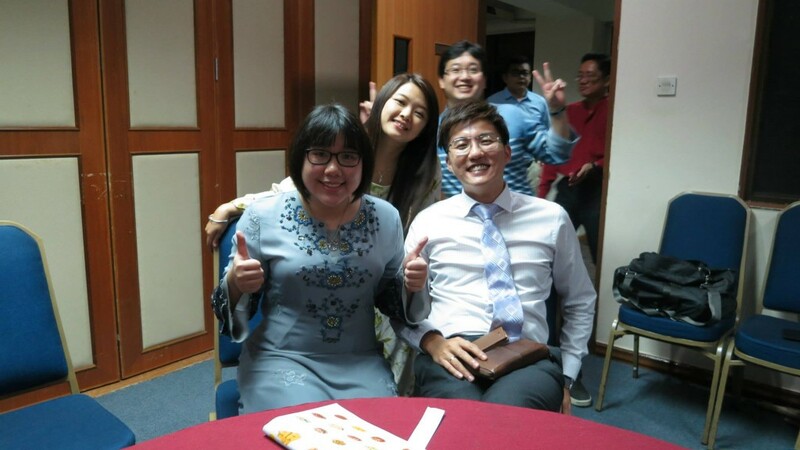 Ling Ling with fellow BSC members during Hari Raya gathering in 2014. How long have you been in Toastmasters and how have Toastmasters helped you so far in your academic life? I’ve been in Toastmasters ever since I turned 18 and it’s definitely helped with my social anxiety. I don’t have spasms whenever I raise my hand in seminars anymore and I don’t feel like bursting into tears whenever the lecturer calls on me, which is great! But one of my defining moments is when I met an old teacher of mine and she commented that I actually look her in the eye now. 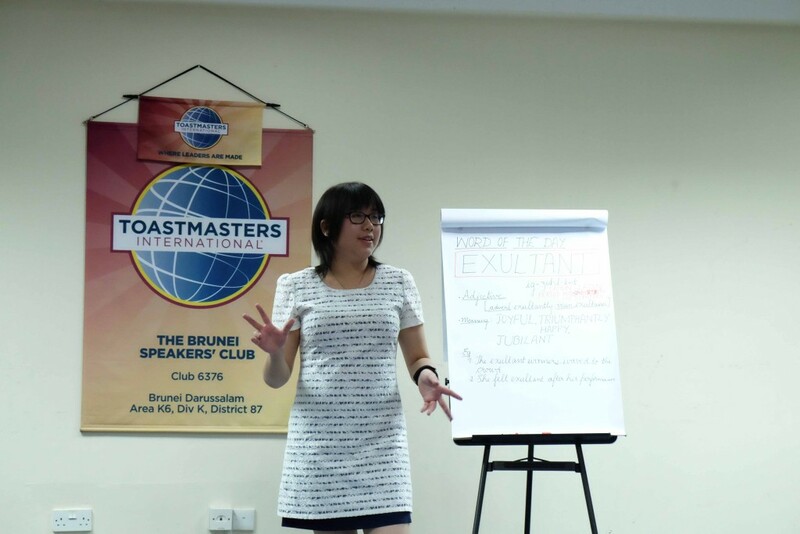 It made me realise that Toastmasters is one of those things that worms its way into your life without you knowing and changes the way you look at things for the better. You won the Division H International Speech Contest and emerged as the second runner up for District 91 International Speech Contest. Tell us about your journey and the challenges that you faced. It was amazing! People in the UK are really supportive. I couldn’t drive and I was horrible with directions, so my mentor would drive me around in his car to all my contests. I would recite my speech over and over on the way there and he would comment every now and then on my accent or my sense of humour. He even let me practise my speech in his barn and stayed over on the weekends! In return, I would weed his garden and feed his goats. 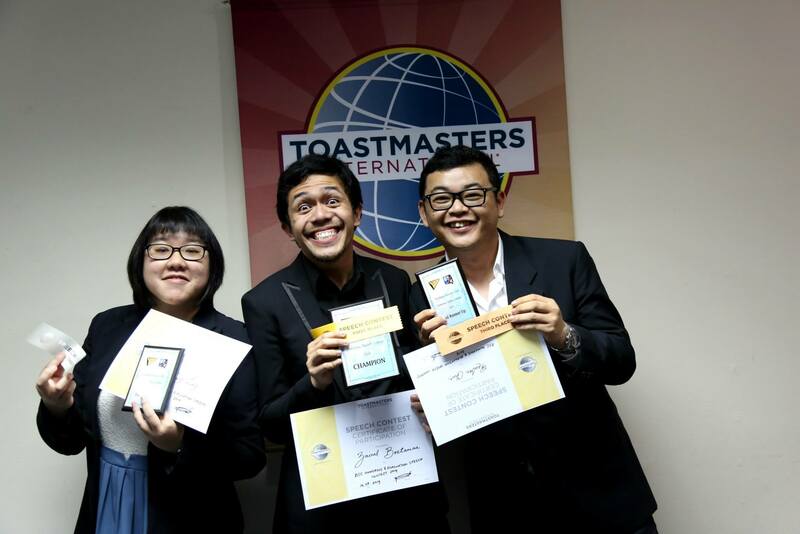 Ling Ling – 1st runner up of BSC Humorous Speech Contest 2014 – along with fellow winners -Zainal and Reuben. Story telling seems to be your greatest strength as your voice always captivates us the moment you speak. Share with us a few tricks on how you train your vocal variety? Aw… Shucks. Thanks for the compliment. Whenever I write a speech, I always think about what I want my audience to feel. I would pinpoint key phrases and associate an emotion with each of them. Sentimental? Tense? Protective? Then, I would think about how I would say it to make the audience feel the speech with me. But that alone would make the speech an incoherent jumble of emotions, so I would also create a relevant persona to tie all the feelings together. Sometimes, I would pretend to be a frightened child or a world-weary soldier or an avenging protester. The possibilities are endless and so very fun! The descriptive words in your speeches always painted vivid images in our minds. Are you a passionate reader and writer? Definitely! Growing up, I always thought I would be an author. I used to read a lot of classics because I liked being pretending I was really cultured. But nowadays, I just pick out the trashiest romance novels with the most atrocious writing and I read those instead. I’m currently reading one called “My Italian Lover”. Brilliant stuff. But to be honest, I don’t think being a voracious reader has anything to do with writing a good speech. To me, the worst thing you can do is to perform, ad verbatim, something that was meant to be read. Instead, I like to read my words out loud in clusters so I can see how well they sound together. I value that a lot more than utilizing complicated lexis. 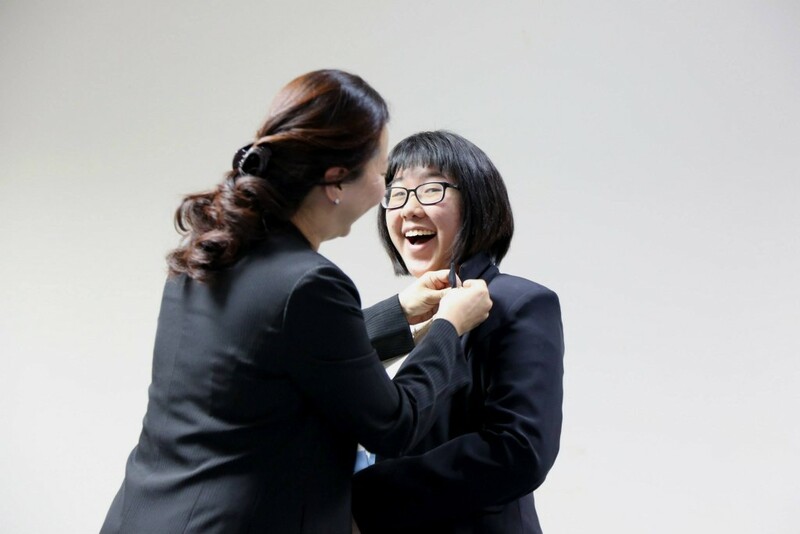 Ling Ling receives her Competent Communicator pin from our Area Governor 2014/2015, Ruey. Just people in general. I think it’s amazing the things people can achieve once they put their mind to it. It makes me think that if I try really really hard, I can do anything too. How has the mentorship program in BSC helped you in your Toastmasters journey? To be completely honest, I thought the mentoring programme was a flake at first. I wasn’t comfortable with trusting anyone with my work, let alone allowing them to criticize it! It got even worse when I found out I was assigned to Hazwan. The guy was my polar opposite in every way. I just couldn’t understand how on earth he was supposed to help me. So, when it came to my CC1, I refused to contact him for help and did it on my own. It was not a speech I am proud of. When I got off the stage, I was crushed. But instead of judging me for it, Hazwan just told me to send him my next speech. I did. And I realised that the finished product was a lot better than anything I could come up with by myself. So I sent him the next speech and the next and the next. Even though he was only supposed mentor me for only three speeches, he stuck by me for as long as I needed. In the end, I got through my entire CC manual with Hazzy’s help and I’m so grateful for it. The kind of support and outside opinion I had from him was invaluable to me and it made me hope to be a mentor half as great as he was. Although. I’m pretty sure I learned a lot more from Rano (my ex-mentee) than he did from me. Well. I’ll get there one day. Ling Ling at BSC’s Installation night in 2015. Once a member, always a member. What are your goals for this term (2015-2016)? To get to Washington for Toastmasters International Convention in 2016, and to finish off my CL (Competent Leadership) manual. I keep forgetting to bring it to meetings.